End of 2012 Columbia Marathon. My name is Greg Fowler. I reside in the midlands of South Carolina. Professionally, I’m an IT person. Amateur-wise, I’m a late start runner. I took up running in December 2008 at the age of 40 when our plant manager stood up in front of the employees and said there would be “changes” after the Christmas break due to the crashed economy. I was fortunate enough to survive the “changes”, and I have continued to run ever since. When I started running, I just wanted to relieve stress. I couldn’t run much more than two minutes without stopping to walk. I had no idea that running would become such a passion. I had no clue about shoes, gear, form, racing or much else in the running world. I do now, though, and I’d like to share my knowledge with others. The goal of this blog is to encourage people, especially those who never ran in their youth, to take up running. Also, I plan to highlight places to run and explore around the state of South Carolina. I have competed in many local races during the last six years. Turns out I’m not too fast, but I have improved. My favorite event is the half marathon, and I have completed seven of them – six road and one trail. 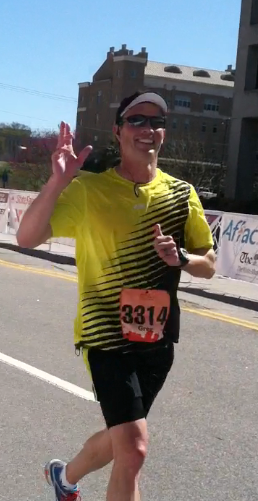 I have also completed eight road marathons, most recently the 2015 Run Hard Marathon in Columbia, SC. I completed my first ultra marathon at the Harbison 50K in January 2013. I don’t blog here anymore, but you can find more writing (including some running posts) from me at http://keyofGF.com. You can contact me at GregoryEFowler (at) gmail (dot) com.